I remember almost a year ago, one of my co-workers mentioned that he was going out to dinner with this girlfriend at a restaurant not too far from where our offices are. He was telling me that he thought that I might like the restaurant because they had this incredible home made garlic bread that was absolutely to-die-for. Not to mention that the owners of this really popular restaurant happen to also own Sweet Rose Creamery, an ice cream parlor that my husband and I both love. After that, I tried to convince my husband that we should try this restaurant out, but prior to their expansion, the restaurant, which is wildly popular and doesn’t take reservations, was small with only some counter seating around an open kitchen, and then a large communal table, that my husband said he wasn’t that interested in standing in line for who knows how long just to sit at a communal table. So, we put this restaurant on the back burner for a while. Once the expansion was completed, the restaurant actually had a dining room and private seating it made trying to get a table there so much easier, so we put it back on the list of places we wanted to try. While we’ve still not made it to this restaurant for dinner to try their amazing garlic bread, they are open for breakfast and lunch, and one weekend morning, prior to flying out of town on a trip, we decided to stop by for breakfast to see what all the hoopla was about. 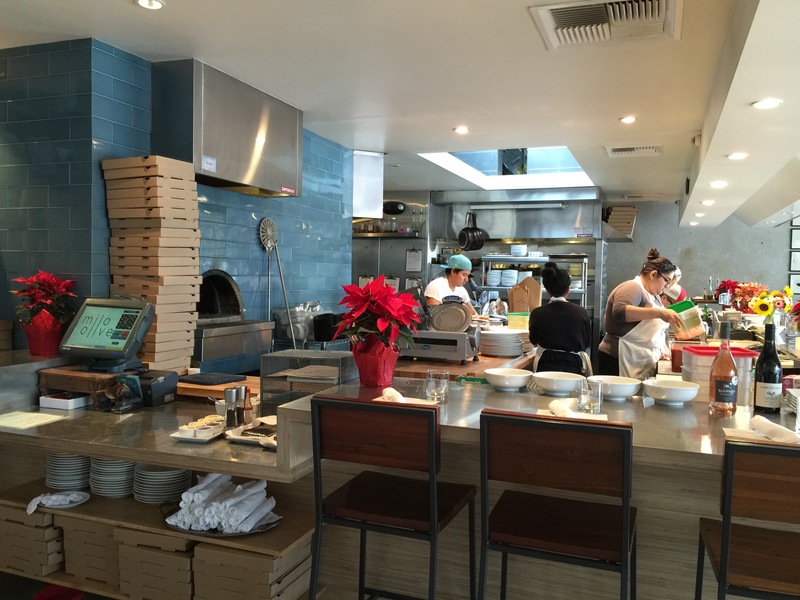 Milo and Olive calls itself a neighborhood bakery and pizzeria located in Santa Monica. Throughout the day, fresh-baked pastries, breads and bakery items are served and sold from its bakery counter, especially popular in the mornings. 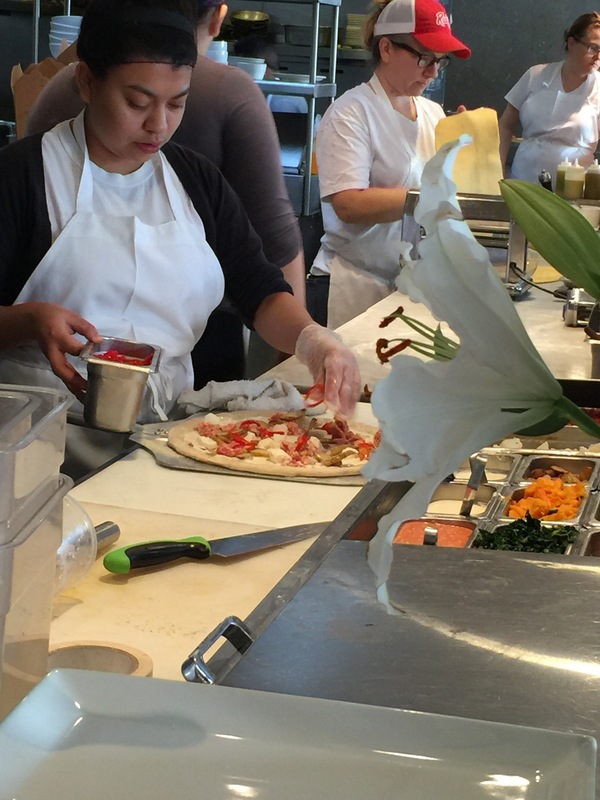 By day and night, the restaurant’s signature wood-fired oven sends out delicious pizzas and their famous garlic bread along with offering up a healthy dose of farmer’s market favorites and shareable small plates on their menu. 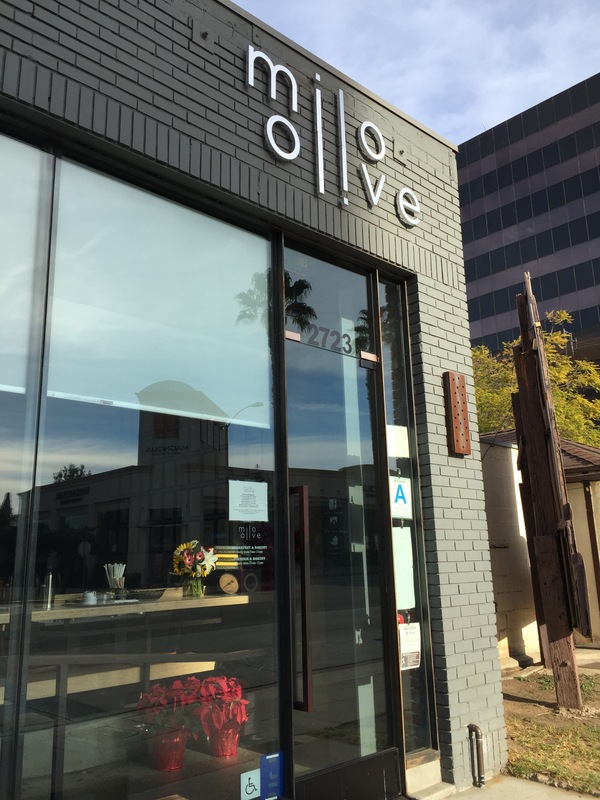 Milo and Olive is the brainchild of Josh Loeb and Zoe Nathan who own a group of popular Santa Monica-based restaurants that are wildly popular and wildly successful. Zoe learned the art of baking while working at the famous Tartine Bakery in San Francisco, and now Milo and Olive is an outlet for her to showcase many of her baking skills by creating pastries and breads and other baked goods that aren’t found at any of the other restaurants within the group. The restaurant is built around an open kitchen with plenty of counter seats at the kitchen where guests can relax and unwind while they watch the chefs prepare their meals right in front of their eyes. I think the idea is for this to be an inviting setting, much like you might gather around the kitchen at a friend’s house when you’ve gone over for dinner. They always say that the kitchen is the heart of the home, and this is like Josh and Zoe inviting their guests into their home by opening up their kitchen. 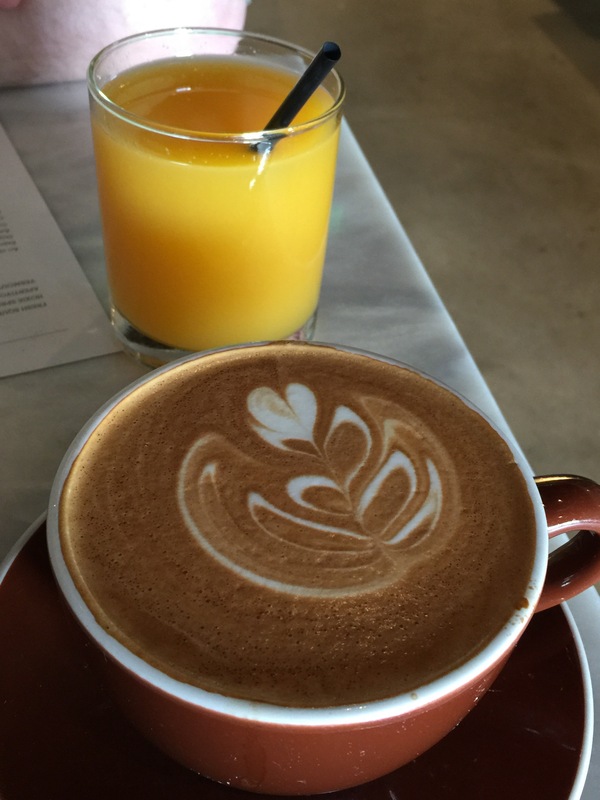 Since we were there for breakfast, I ordered a cafe latte, made with amazing Caffe Luxxe coffee and my husband ordered a glass of fresh squeezed orange juice. I love hand crafted coffee drinks where the barista can actually used the steamed milk to create pictures in your cup. I know, it’s cheesy, but it is an art form. This amazing Caffe Luxxe coffee really hit the spot, perfectly brewed and created with a strong espresso flavor with the perfect amount of steamed milk. And the fresh squeezed orange juice, my husband’s going to love that no matter what. He already loves orange juice, but amp up the wow factor with fresh squeezed orange juice and he really can’t resist. 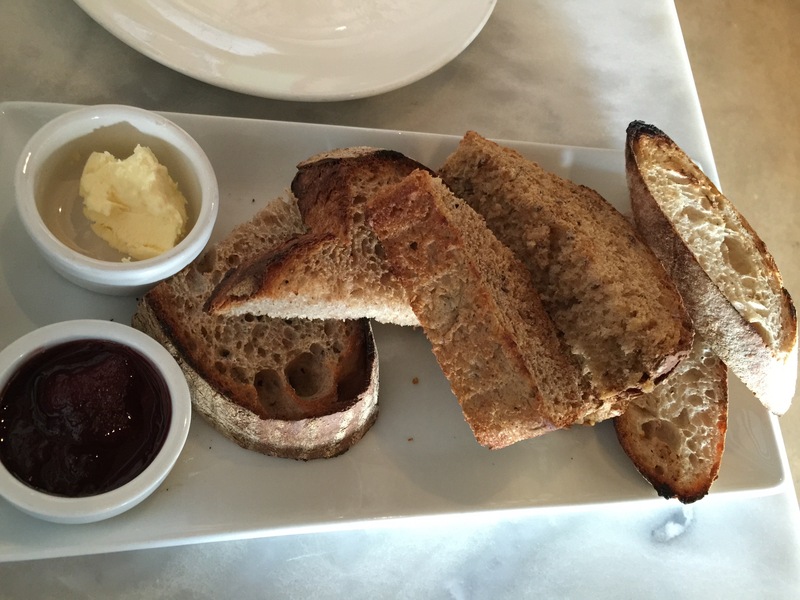 As this is a bakery, to share, we decided to get an order of assorted house baked bread with butter and fresh jam. Nice and toasted, the bread was delicious. Crusty on the outside and yeasty and thick and soft on the inside, this bread was delicious. Although I’m not a fan of jam generally, I actually really enjoyed this fresh jam with the delicious whipped butter. The bakery bread really lived up to its reputation and both my husband and I thought this was a terrific start to our breakfast meal. For my husband’s breakfast dish, he ordered the famous breakfast pizza. 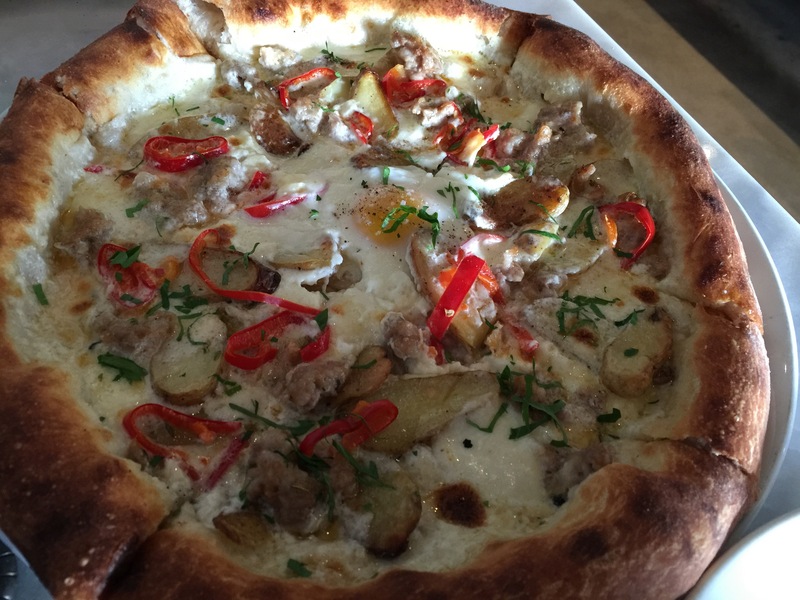 Described as being made with house sausage, potatoes, pickled chili, rosemary cream and finished with a farm egg, we enjoyed the pleasure of actually watching them make this pizza in front of our eyes. Milo and Olive is known as being a pizzeria, so watching them put the toppings on the pizza and assemble everything that was needed for the breakfast pizza, all the way through putting it into the wood fired oven, taking it out and adding the farm egg as a final touch was pretty cool. From the oven, the pizza was cut and brought straight to the table, piping hot and with a perfectly blistered and crispy crust. 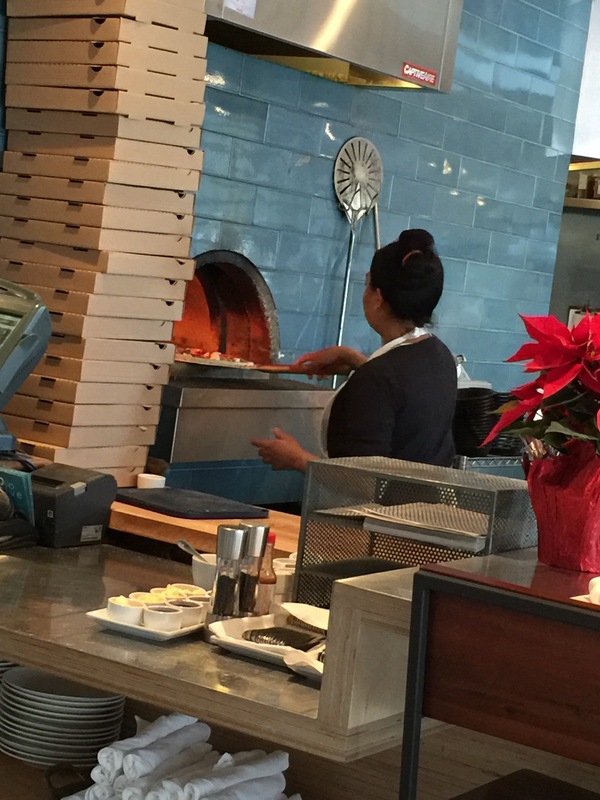 The pizza was gorgeous, and it wasn’t hard to see why Milo and Olive is known for their pizza. The egg was perfectly sunny side up with a nice and runny egg yolk. My husband said that the flavor of the pizza was outstanding. The homemade sausage was flavorful and the potatoes were tender and perfectly cooked. The rosemary cream had great flavor and brought everything together. However, the pickled chili was really spicy, and eventually ended up being a little too much for my husband’s taste buds. He felt like the chilis were burning his tongue and he was losing the flavor of the pizza. Therefore, the pickled chilis just made it a little too much, so my husband eventually had to just pick the chili off of the pizza. That left behind some of the flavor and the pickling tang of the vinegar, but removed most of the heat. But that didn’t deter my husband from eating and enjoying his pizza. For a breakfast pizza, my husband really enjoyed this and thought it was really well done and perfect for a breakfast meal. For my breakfast, I ordered the pan seared porchetta with fried eggs and roasted chimichurri potatoes. 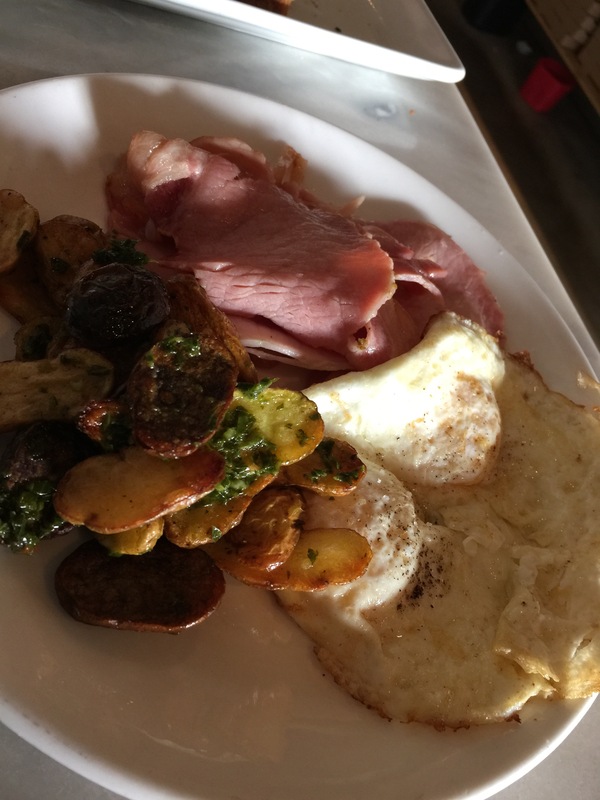 Essentially, it is your ham, eggs and potatoes breakfast plate done with a little flair. Porchetta is savory, fatty and moist boneless pork roast that is thin cut and pan seared to heat it up and give it a little bit of crispiness and texture. The eggs were cooked to a nice sunny side up with a runny yolk. What I ended up doing was putting the eggs on top of the porchetta and then cutting into it so that the egg yolk ran over the delicious ham. But the real star of the dish was the chimichurri potatoes. The fingerling potatoes were perfectly roasted so that they had a nice caramelization on the outside but were still tender and fluffy on the inside, and the chimichurri sauce was outstanding. There was enough of it spooned over the potatoes to add a ton of bright, fresh flavor, but not so much that it completely overpowered the flavor of everything else on the plate. This was a hearty, flavorful breakfast meal. Milo and Olive provided us with the hearty, filling and delicious breakfast we were looking for before heading to the airport for our quick trip out of town. The restaurant felt more like your hometown, neighborhood bakery and coffee shop rolled into one, a place where everyone comes just to hang out and read the morning paper and enjoy their morning cup of coffee while chatting with the people working behind the counter. My husband and I loved the feel and atmosphere of Milo and Olive, but beyond that, we really enjoyed the food. It’s no wonder that Milo and Olive has the reputation it has, because it lives up to all of the accolades that make it one of West LA’s most popular restaurants. Now, my husband and I just have to find time to come back for dinner one day and really try out their amazing pizza oven.